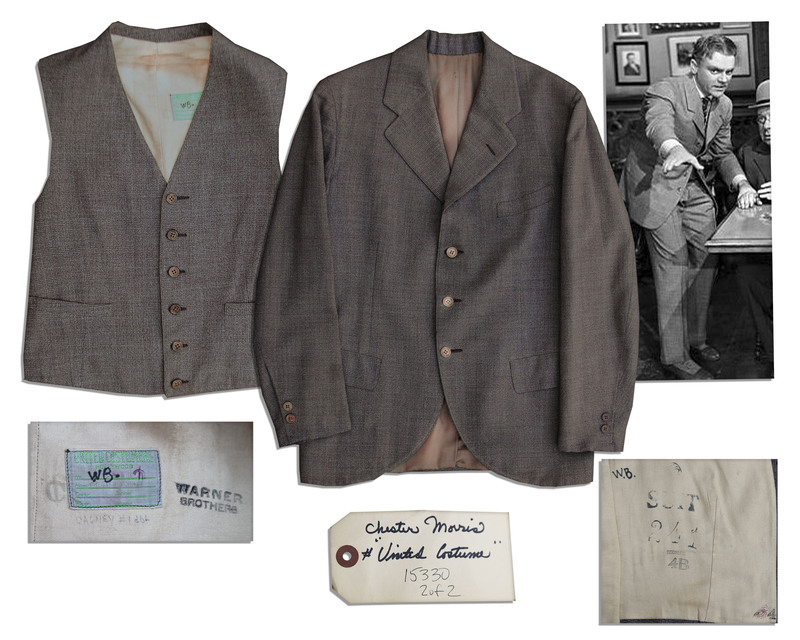 To auction, buy or sell James Cagney memorabilia or James Cagney costumes in our James Cagney memorabilia auction , please contact NateDSanders.com at (310) 440-2982 or Nate@NateDSanders.com. Academy award won by James Cagney in 1942 for his sublime and spirited performance as George M. Cohan in “Yankee Doodle Dandy”. Critics have resoundingly proclaimed his performance in this film to be one of the greatest of all time, and it garnered the then 43-year old actor his only Academy Award. Oscar statue is a knight figure posed perfectly symmetrically with a crusader’s sword, and standing on a film reel, the five spokes of which represent actors, writers, directors, producers and technicians. 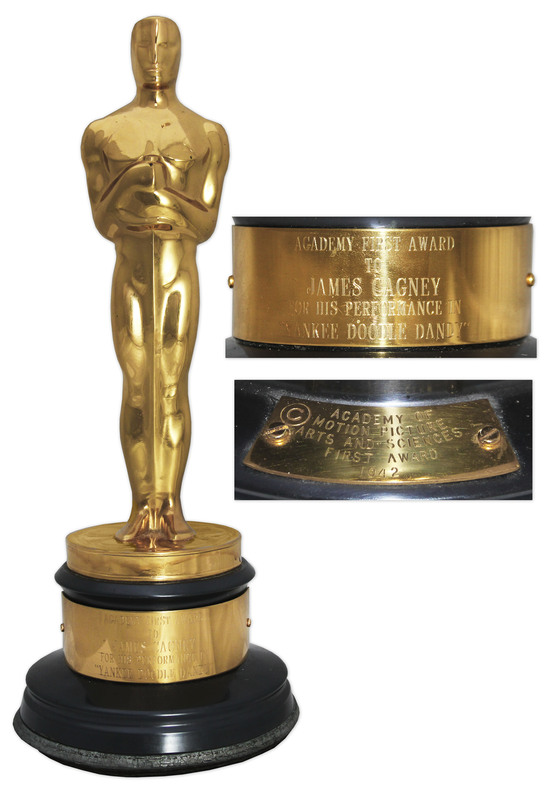 Gold-plated brittanium statue sits atop a black lacquered metal base bearing one plaque to the front which reads: “Academy First Award / To James Cagney / For His Performance in ‘Yankee Doodle Dandy'”. A smaller plaque upon the back reads “Academy of / Motion Picture / Arts and Sciences / First Award / 1942”. A Dodge Co. plate is also on the back of the Oscar; Dodge is the company that made the post-WWII Oscars given to the recipients to replace the plaster Oscars they received during the war. Oscar statue measures 13.5″ tall and 5.5″ in diameter. Weighs 6 lbs, 9 oz. In near fine condition with brilliant luster. The most significant piece of James Cagney memorabilia ever auctioned. Originally from the James Cagney estate, sold by Doyle Galleries in 2000. James Cagney screen worn wardrobe from the classic musical ”Yankee Doodle Dandy”. Cagney portrayed Broadway megastar George M. Cohan in the acclaimed picture. Two-piece tailored wardrobe by United Costumers of Hollywood comprises a suit jacket and matching vest in textured brown. Cagney appears in the outfit during the scene where he and his partner, played by Richard Whorf, deal smoothly with an impresario, played by S.Z. Szakall. Single-breasted suit jacket has ”Cagney #2” handwritten on the sewn-in label in the interior pocket. The same mark appears on the vest’s tag. Incidentally, these same pieces were previously used for actor Chester Morris, as his name is typed onto both labels with production number 763A. Blazer measures 20” across. Garments are near fine. Rare James Cagney memorabilia. Sold for $4,576.